No Jameis Winston, no Ryan Tannehill and ultimately no Jay Cutler, a game that was supposed to be played in Week 1 of the season between the Miami Dolphins and Tampa Bay Buccaneers had a much different feel to it in Week 11, than it might have had earlier this season as injuries have taken it’s toll on each team. The Bucs were able to escape with a 30-20 victory over the Dolphins, even if the final score is not quite indicative of how close this game was at the end. Despite jumping out to a 20-7 lead at halftime, the Bucs watched their lead evaporate in the final quarter of play as backup QB Matt Moore, who was filling in for an injured Cutler, hit WR Kenny Stills for a 61-yard touchdown to tie the game at 20-20 with 3:09 left in the game. However, Tampa QB Ryan Fitzpatrick led an impressive game-winning drive in the final moments, capped by a 35-yard Patrick Murray field goal to give the Bucs a 23-20 lead with just 0:04 left. On the day after the anniversary of the Cal-Stanford infamous band-on-the-field-kick-return-lateral-extragavenza, the Dolphins last-ditch effort on their own take of laterals would not be nearly as successful. 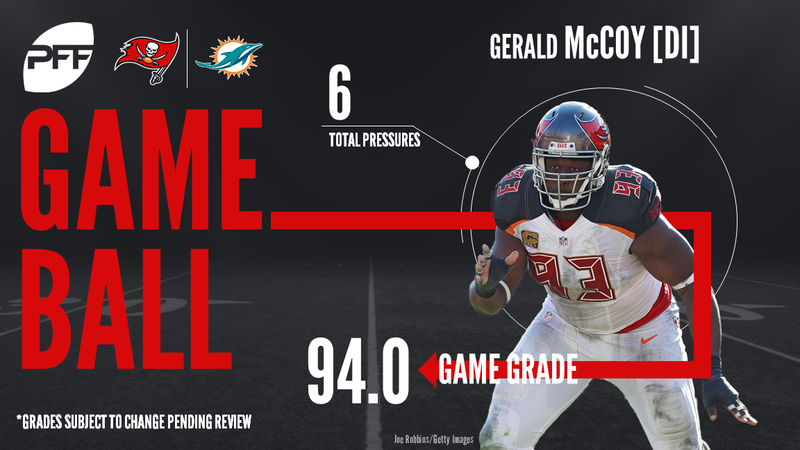 Bucs LB Adarius Glanton landed on the loose ball after a failed lateral attempt in the end zone on the game’s final play for a pad-the-score-touchdown to push the Bucs win to 30-20, with that, we give you our PFF exclusive takeaways from the contest for each team. Fitzpatrick finished the day 22-of-37 for 275 yards and two touchdowns, but was victimzed by two drops and sacked once. Fitzpatrick did a great job on deep shots, completing all four passes in the air of 20 yards or more and finished with 99 yards on these deep passes. Most of these completions were seam routes down the middle of the field. He also utilized play action well, throwing for 44 yards after a play fake. Evans finished with five catches for 92 yards while he hauled in a deep pass for 29 yards en route to catching all five catchable passes thrown his way. Evans had two of his catches working out of the slot, totaling 46 yards. McCoy has had an interesting season where he started it off on fire and cooled down Week 5-9, including two poor performances against Buffalo and Carolina but has arguably been the best interior defender in the NFL over the past two weeks. Virtually unblockable against Miami starters and backups, McCoy racked up a sack, two QB hits, and three hurries while also tacking on four run stops on just 16 run snaps resulting in a run stop pecentage of 25.0. Over the past two games, McCoy ranks second in pass-rushing productivity at 12.9 and run stop percentage at 20. Ayers has quietly had an excellent season and today was no different as he delivered with two QB hits and a hurry while performing well against the run as he clogged running lanes despite not litering the stat sheet with tackles. Ayers has just two sacks on the season but leads the NFL in QB hits at 14 and is sporting a very good 9.3 pass-rushing productivity. Anyone watching this game saw the stark difference in the two Dolphins QBs where Jay Cutler’s 54.2 grade in the first half put the team into a major hole while Moore’s play brought them to a tie game before Fitzmagic happened to drive Tampa Bay down the field for a game-winning field goal. While Cutler struggled mightily under pressure with a passer rating of 29.2, Moore was poised with a very good 83.9 passer rating when under duress. Moore was excellent throwing deep as he completed two of his four passes for 106 yards, one touchdown and a passer rating of 135.4. A monster game from Stills as he caught all but one of his aimed targets resulting in a perfect passing rating of 158.3 and his 4.5 yards per route run led all 1:00 PM kickoff games. No matter which way you slice it, seven catches for 180 yards and a touchdown is an excellent day, easily the best of his season and possibly his career. T.J. McDonald was a star for the Miami Defense contributing two stops in run defense while only yielding one catch on two passes thrown into his coverage and was generally all over the field for the Fins’ defense. Godchaux was a force inside for Miami’s defense against the Buccaneers blocking schemes. Godchaux totaled four defensive run stops and was fun to watch defeating Buccaneer blockers. Miami’s defense played well overall and seemed to be in control until Fitzgerald’s last minute drive to win the game.